Cinnamon Ridge Farms offers pasture raised , Jersey Beef. Why Purchase Cinnamon Ridge Beef? Our beef is cared for by dedicated family members and employees. 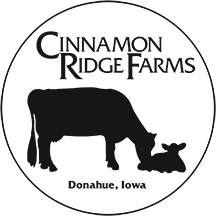 Cinnamon Ridge Farms was award the Farmers Assuring Responsible Management for Dairy Farms. This assures our customers that our milk and our beef meets very high standards for sustainability and animal care. For more information click here. How do I purchase a butcher beef? Beef sells by the pound on the hanging weigt at the locker. Your beef can be packaged to your specifications. You have the choice of how many steaks you want in a package and what size packages of ground beef, roasts, etc. that you want to fit your needs. We base the price on the current price of beef. It takes about two and one half weeks from the time we take the beef in until you are able to enjoy your beef. Our beef can be purchased at our on-farm store by the package. We also sell beef by the half, split half (1/4), whole, or bundle. ***Note: different items may be substituted based on availability of the cut. Please indicate if you are interested in a whole, half, split half, or beef bundle.